Due to the confidential nature of this product, and to protect the privacy of our clients, this enrollment may only be completed by the accountholder. 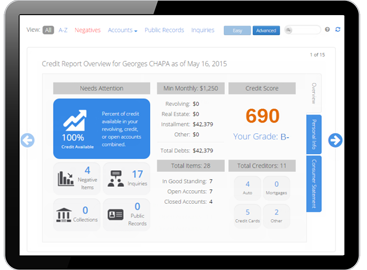 We've made your credit report horizontal and easy to read! Search or find anything quickly and utilize tabs to view more or less detail. Through Smart Credit, you'll be able to view your credit score, auto score, insurance score and even a hiring risk index for job seekers. Mange all of your online accounts in one place, integrated with your credit and identity. Not only is it the best and most complete picture of your money, but it's interactive! You can use Action buttons to ask your creditor a question about your account or a transaction- no phone calls or writing letters are necessary. Track and update your account balances, bills coming due and transactions each day.